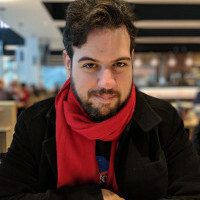 Technical Director at Chucklefish Games, also currently Lead Programmer & Producer on Wargroove, an upcoming turn-based light strategy game. Been making games as a hobbyist since 1997, and professionally since 2008. Born in Brazil, moved to the UK in 2012. Previous works include being Lead Programmer on Aegisub and Lead Programmer on Bossa Studio's Worlds Adrift. Are you writing or considering writing a custom engine for your next game project? This session discusses the lessons learned from developing Wargroove for Windows, Mac, Linux, Nintendo Switch, Xbox One and Playstation 4, using a custom engine written in C++14. It explores why Wargroove went with a custom engine, whether it was the right choice, and how big of an undertaking it was. It also seeks to answer whether a custom engine is the right choice for you, what challenges lie ahead of those who go down that road, which skills will be required of them, and how this choice affects the wider team, beyond programmers. Finally, it provides some practical tips that should be helpful if you are interested in writing your own engine. Should you write a custom engine for your next game? How big a task is writing an engine? What skills do you really need to write a game engine?